I don't do handwork anymore other than a little crochet and some English Paper Piecing, mainly with hexagons. 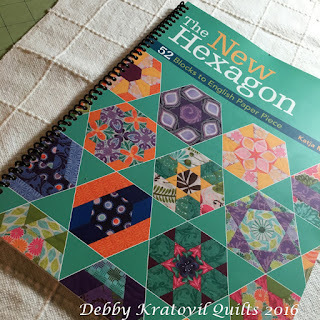 I thought you might like to see some of my recent finishes as a result of being part of Glorious Hexagons Facebook page. 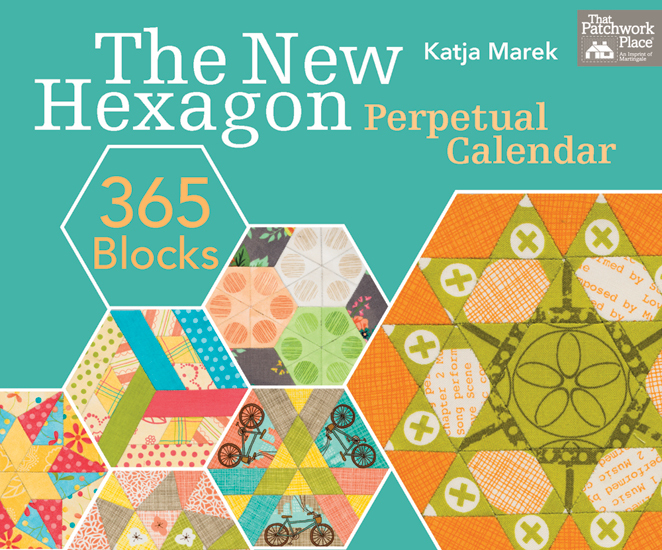 This is based on the book called "The New Hexagon" by Katja Marek. 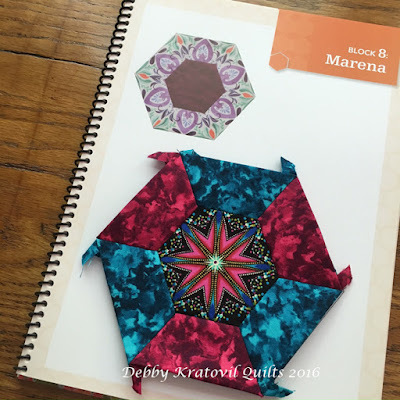 I took mine immediately to get spiral bound so it will lie flat. 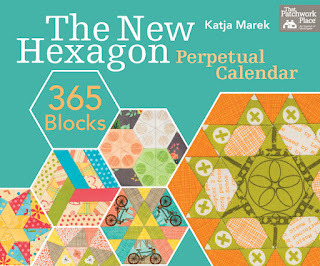 And coming this summer is a perpetual calendar with 366 more blocks! 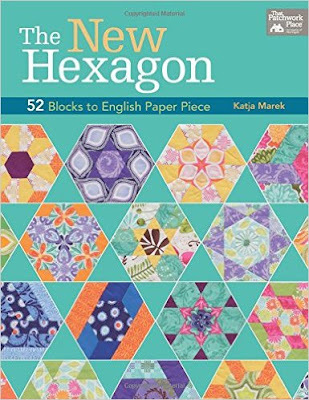 Now, let's see some blocks! 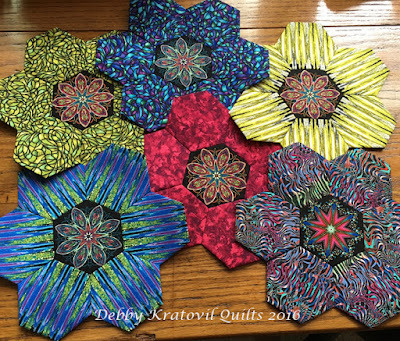 First is my version of Twisted Hexagon (a class I've taught for a few years, but only using rotary cutting and stitching). Marilyn is Block #32 and I used the Kaffe Fassett fabric called "Target" for that bull's eye center! Mary Ellen is Block #28. 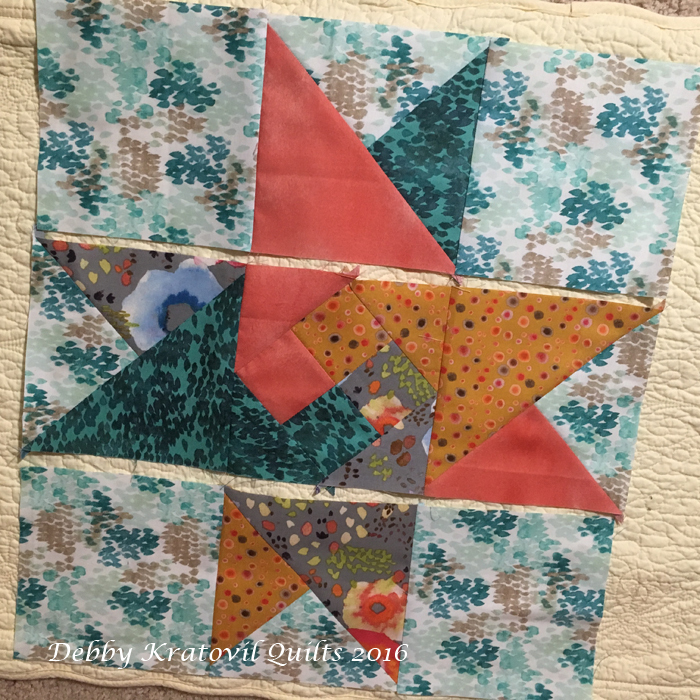 I didn't like the blue triangle because it was too dull. 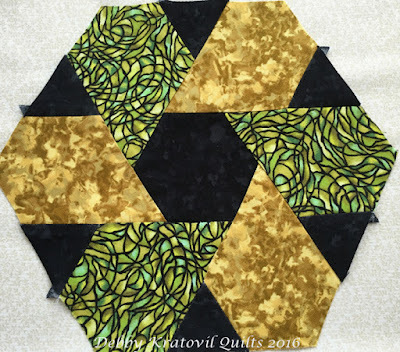 I am in the process of replacing those two triangles with either the cream or green stained glass fabric. 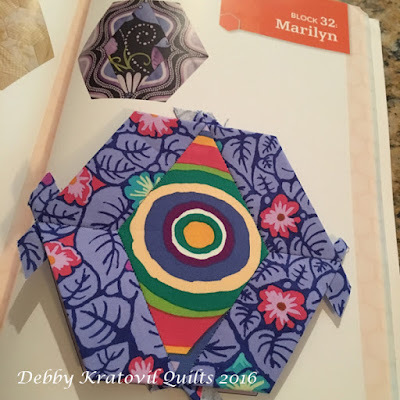 Notice how Marilyn and Mary Ellen are very similar with the outside shapes. 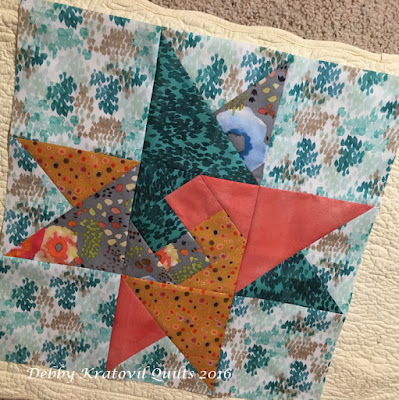 The center is pieced in Mary Ellen and a single fabric for Marilyn. And for the 4th "M" name: Marie! 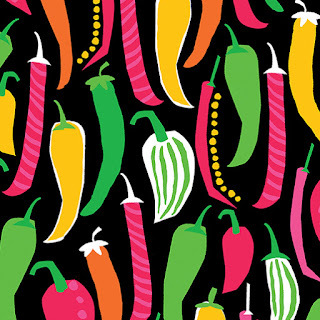 Don't you just love these motifs? 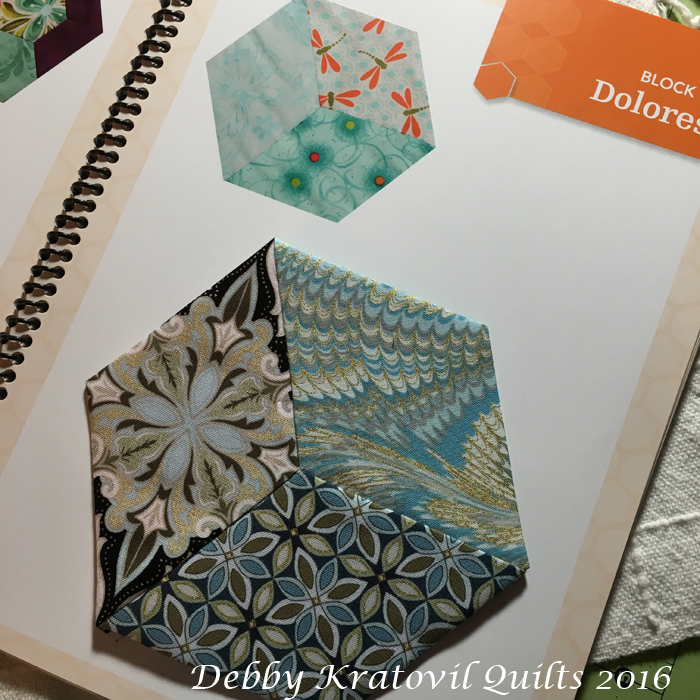 Now for Dolores, Block #6. Very simple using three 60 degree triangles. I buy my papers online with Paper Pieces. Always have. Though, in a pinch, I will print and cut my own out of card stock. Here is a small order I received last Friday. I generally put in large orders for packs of these for my classes. 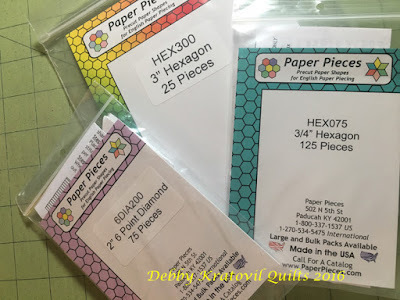 My students each get a pack of 100 1" papers, along with small sets with fabric of other sizes. And last, but not least, my own upsized blocks using 1-1/2" hexagon papers for larger GFG blocks. And here are the parts before joining. 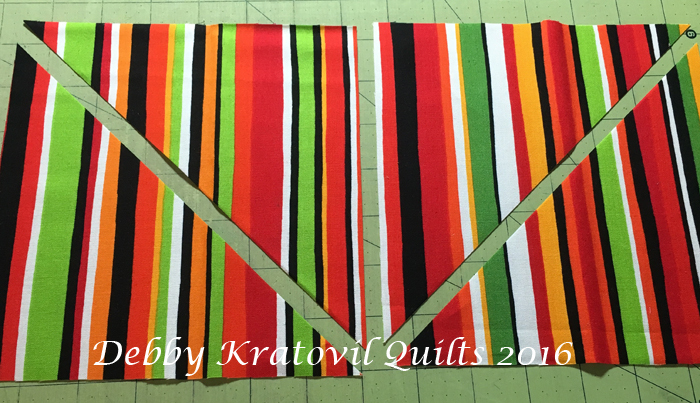 Made sure my stripes were cut in the same direction! 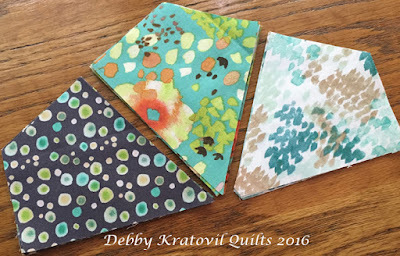 I love that it is so easy to take along a little bag with papers, fabric, thread and needle. And I seem to always do more when summer comes. I have more to share, but for now, these are happy to meet you! My winner in the Benartex Bali Blog Hop fat quarter giveaway was Rosa. I'm still waiting for her to contact me. I give winners 48 hours and then I move on to second choice! Rosa - please phone home! I plan on tallying up the votes, but because I was on the road I couldn't do it during the hop. You will see more of these blocks and shapes. 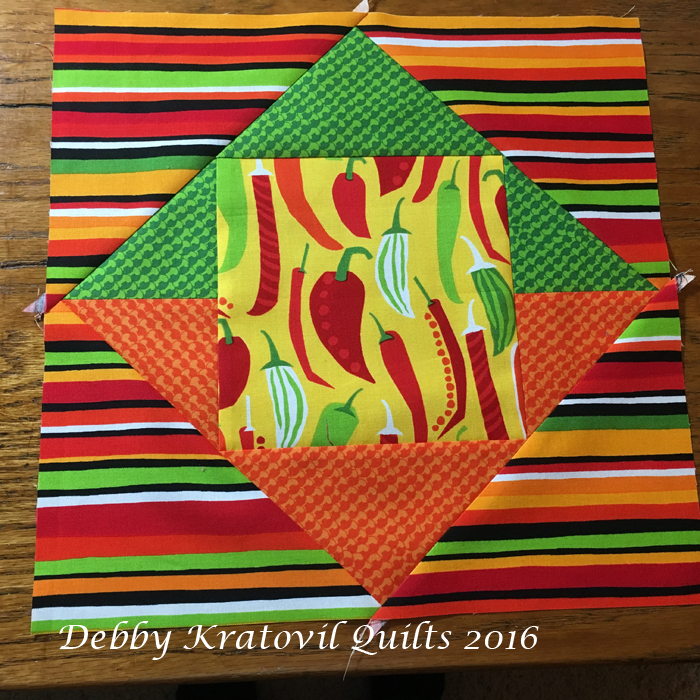 Here is what I did with that block I shared. And then I cut a few more diamonds and another block appeared. Like I said - I'm stuck on this shape! 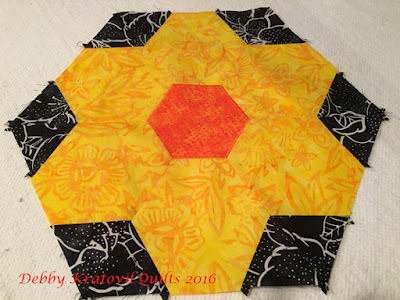 First, the Daffodil block with a small orange hexagon appliqued to the center. 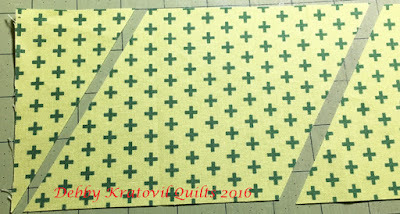 This is fusible, raw edge applique (the easiest and quickest approach). 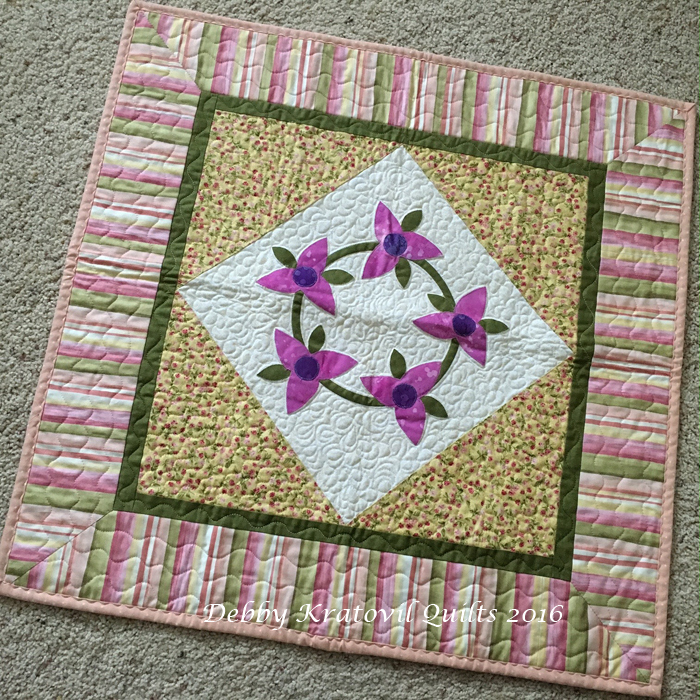 As soon as I covered up the center I realized I had created a Grandmother's Flower Garden block! Congratulations to Rosa. And many thanks to all of you - all 171 of you - who sent in your votes for my 3 blocks made using that jewel shape. 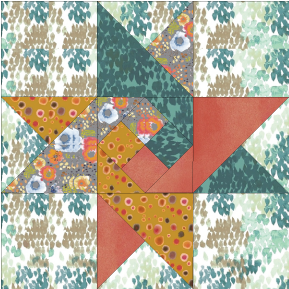 Stay tuned for another tutorial coming up using these diamonds in a very modern way. That's all I can say! 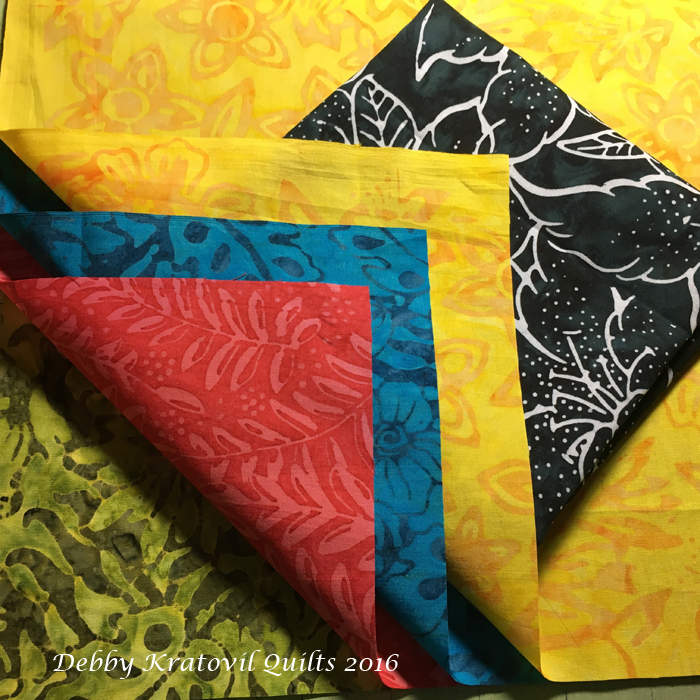 Head on over to the Sew in Love with Fabric blog today to see what I did with some of these new batiks from Benartex. Yes, I'm still working with that jewel shape. 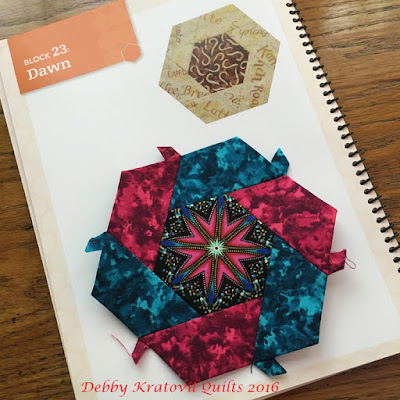 Come see what I did! For a chance to win a fat quarter bundle of the Dolce and Rio fabrics we're featuring in this blog hop, head over to Sew in Love with Fabric to see my 3 new blocks. Come back here to let me know which of the 3 blocks you like (#1, 2, or 3). 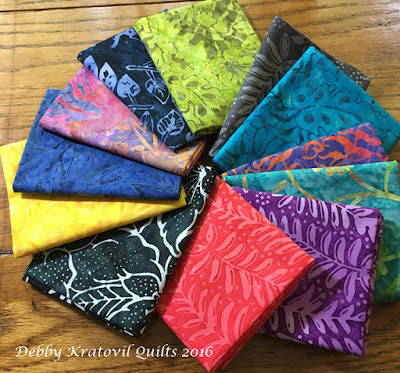 Contest is over midnight Wednesday, May 18. 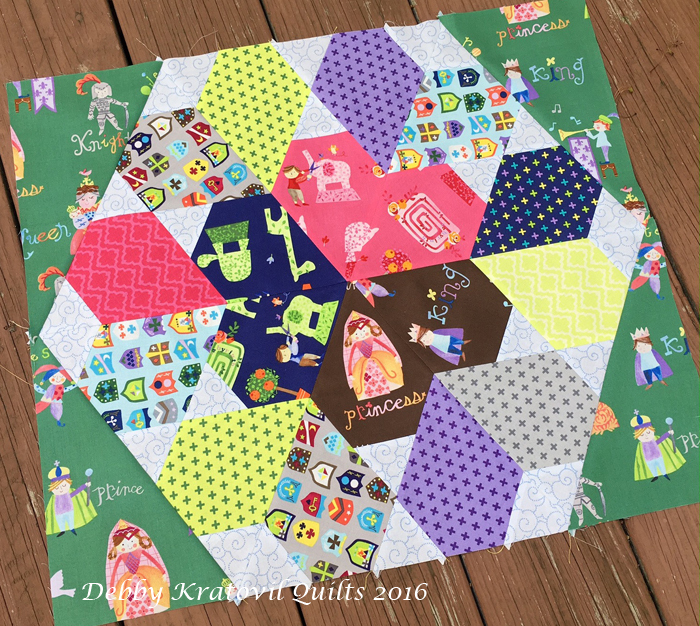 Meet the Royal Court is a delightful novelty print from Windham Fabrics. With images of kings and queens, jesters and even the Royal Pet! I am enamored lately with the 60 degree jewel shape (some call it a "gem"). It is basically a 60 degree diamond with a triangle lopped off of one end. I am not too keen on single size templates. I mean, what if you want to work with a different size? Then you either are out of luck or have to buy another one. 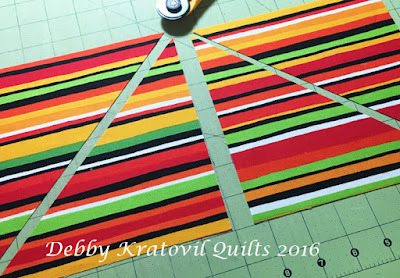 Why not use the lines on your acrylic ruler? Why not, indeed! Then you can cut just about any size diamond and jewel. Because I only have an 18" x 22" piece of each fabric, I am limited in what I make. I love those sorts of challenges. I cut 4-1/2" strips from most of the prints, saving the larger prints for a border. Then using the 60 degree line on my 6 x 12 ruler, I lopped off the left side. Then I measured 4-1/2" from that cut and made a second cut for my perfect diamond! This diamond measures 4-1/2" in size from flat side to the opposite flat side - in both directions. I was able to get 3 diamonds from each 4-1/2" x 22" strip. 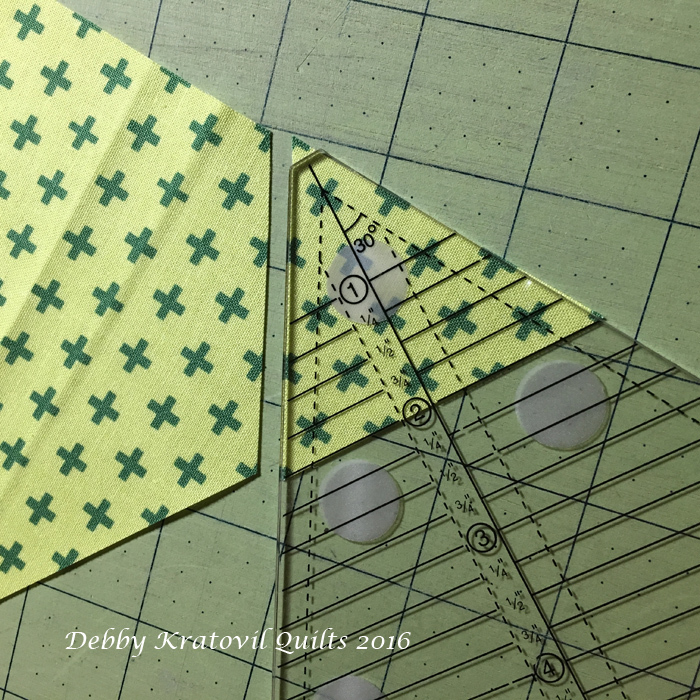 Cut a 2" triangle (using a 60 degree ruler) from one pointed end. 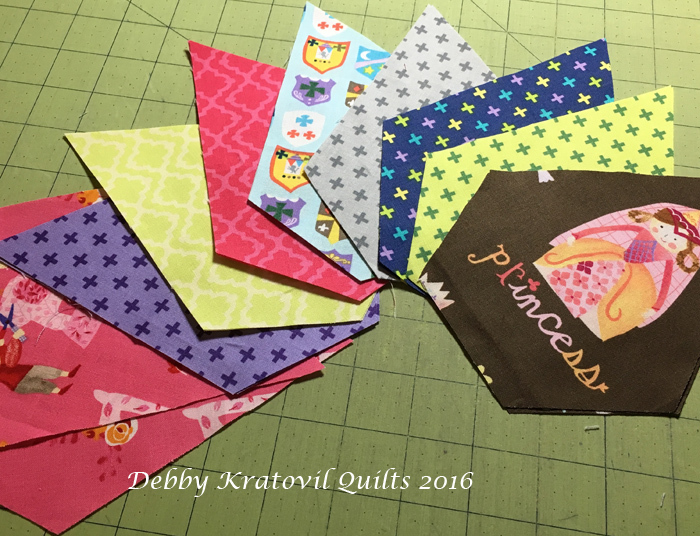 I did fussy cut some of those motifs. 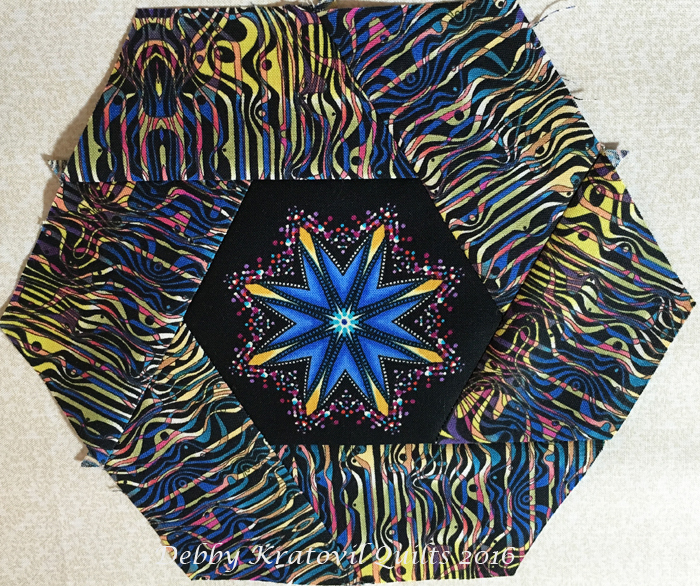 I cut a freezer paper diamond, made it into a jewel, cut out the center and then was able to center the motifs I wanted. 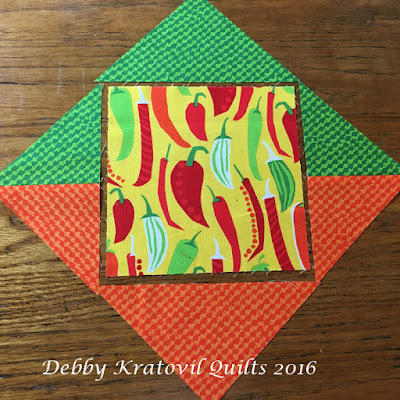 Then I selected a light print (using another Windham print from another collection) and cut 2-1/2" high 60 degree triangles. Twenty-four of them, to be exact. 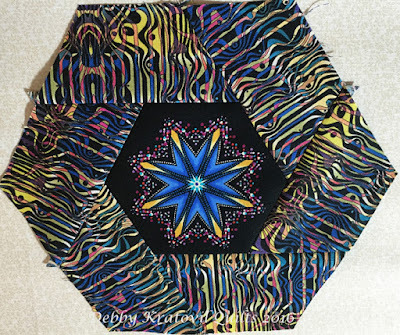 Then with my plan, I began placing the "jewels" on my design wall, moving them around. I decided to keep 3 matching sets in the center, sort of like hearts. The rest were randomly placed. But how to sew them? 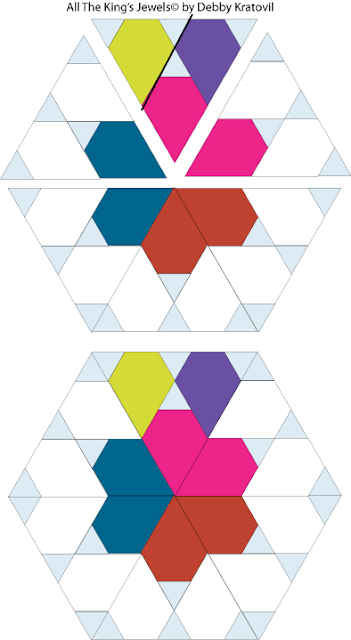 You can see in the diagram below how I sewed them into six equal sized large triangles. 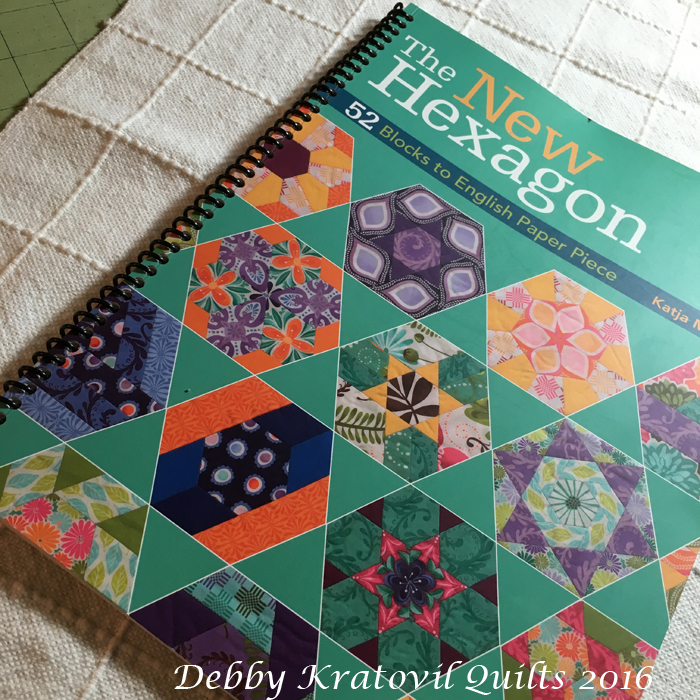 Then the pieced triangles into a large half-hexagon and then into the very large (20" high) pieced hexagon. (No pattern yet; I'm still on the road until the first of June). I colored the top pieced triangle so you could see the piecing sequence. 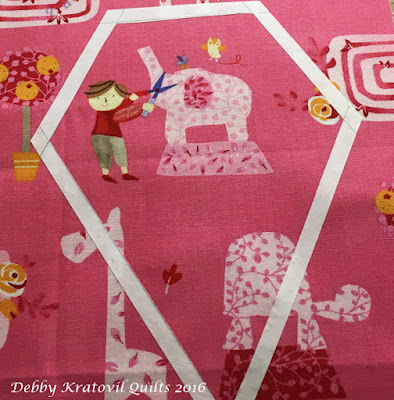 No set in seams; all straight seam sewing. All of the remaining jewel shapes are the random colored jewels patches. 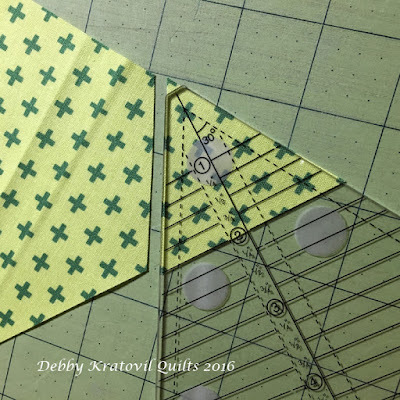 Then I cut four 30 degree triangles from the green fat quarter. I actually got all four from that one piece. I did have to audition the cutting with a large piece of paper - no room to make a mistake! A lot of talk of margaritas and Mexican food today. 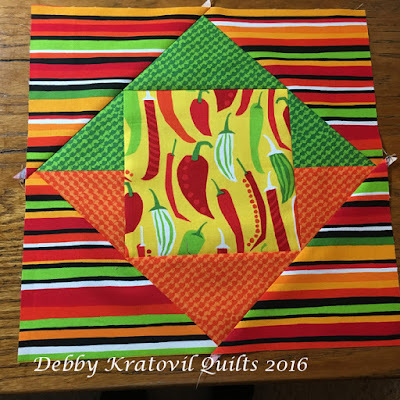 I can't handle a margarita (just ask my kids! ), but I've always loved Mexican food. Raised in California and loved all things Mexican. 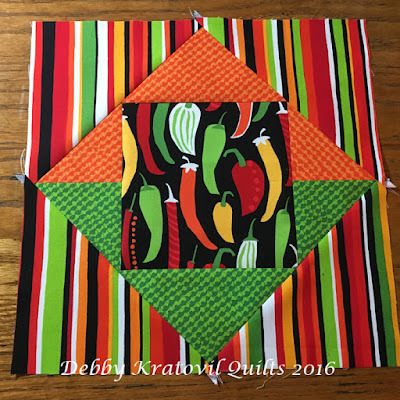 I was reminded of the block I designed for Quilt Magazine in 2007 which I called Olé. 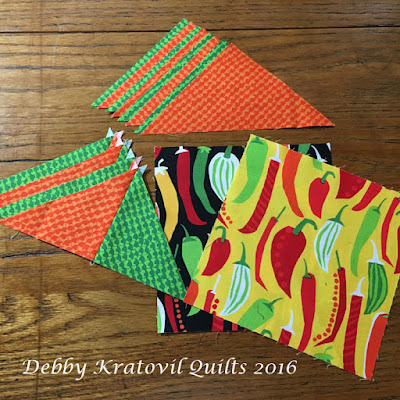 And I remembered the Benartex "What's in My Pantry" Collection which I featured here a few months ago. 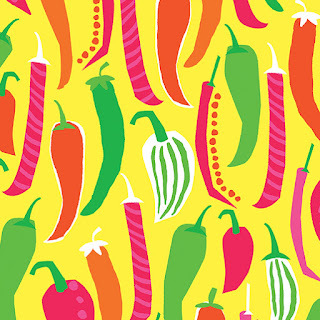 I was thinking CHILI PEPPERS and there are two fabrics in that collection with chili peppers on them. 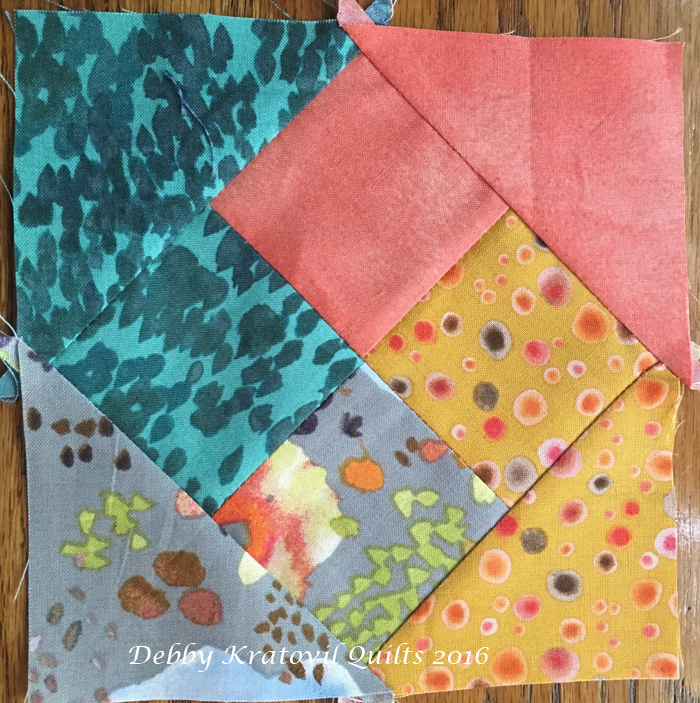 Here are my steps to quickly cut and stitch these two blocks (which I made this morning in one hour's time). 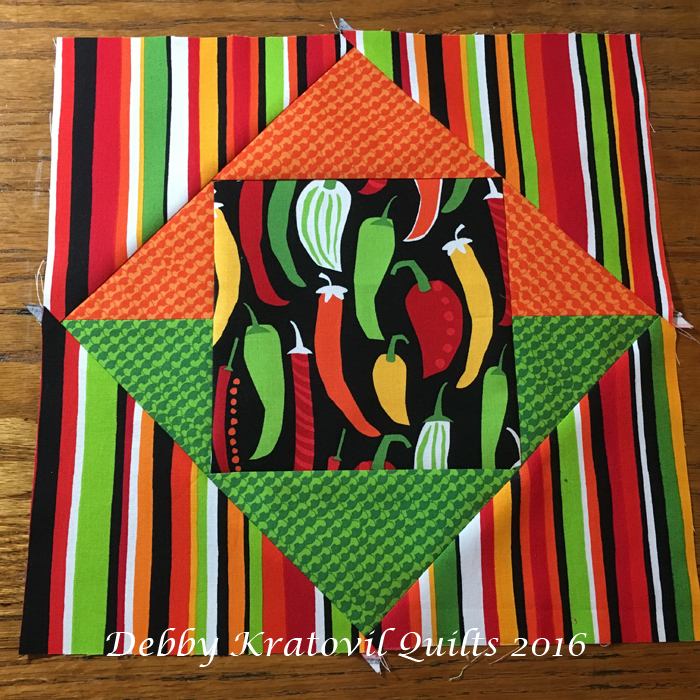 I used these two pepper fabrics as the center of my blocks. Aren't they yummy? 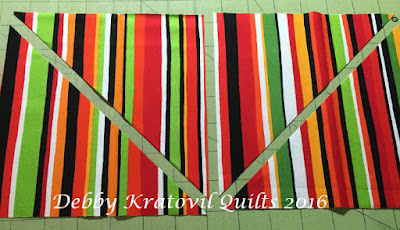 I audition the stripes by folding and putting next to the block. 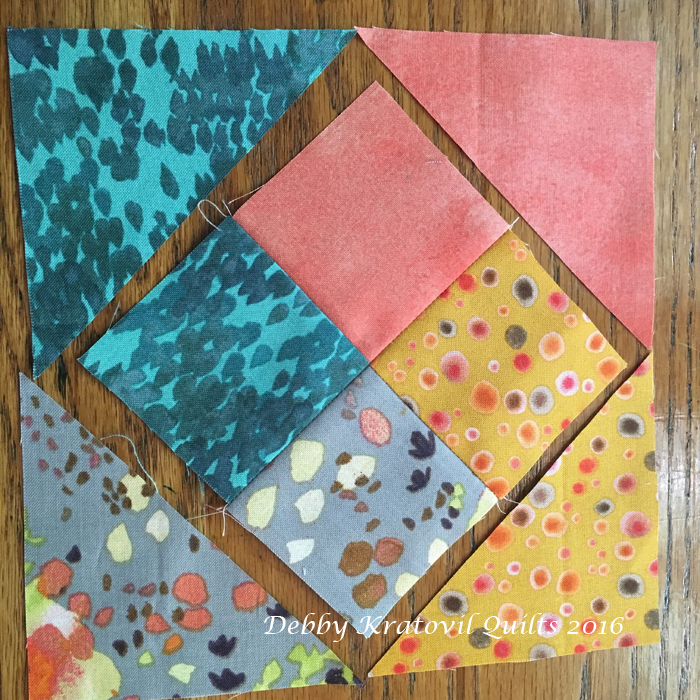 The key is to cut two squares and put them side by side. Then cut in a "mountain" cut. You can't get the triangles to work if you cut both squares at the same angle. 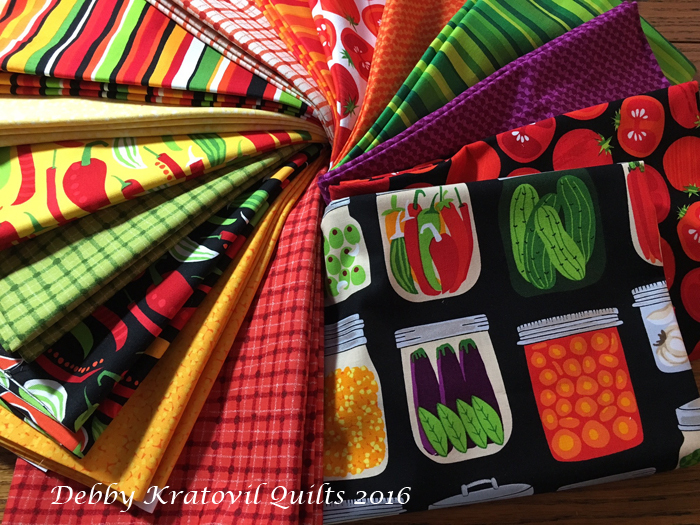 I love playing with new fabrics. 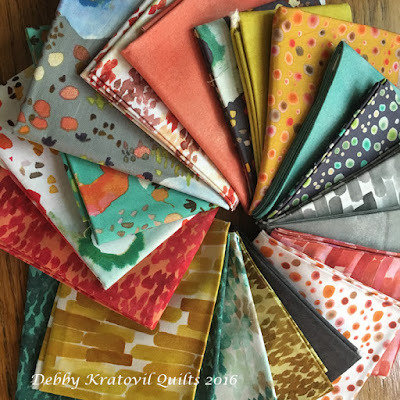 And I love getting fat quarters because it keeps my creativity under control. 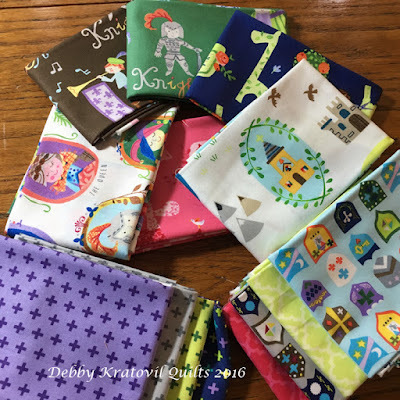 Windham Fabrics sent these a few months ago and I began planning and cutting but never stitched up my idea. 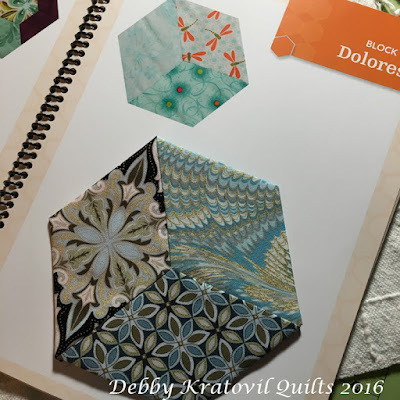 Flora by Kelly Ventura is a collection of modern watercolor florals. Aren't those so yummy? I have stacked them and re-stacked them. 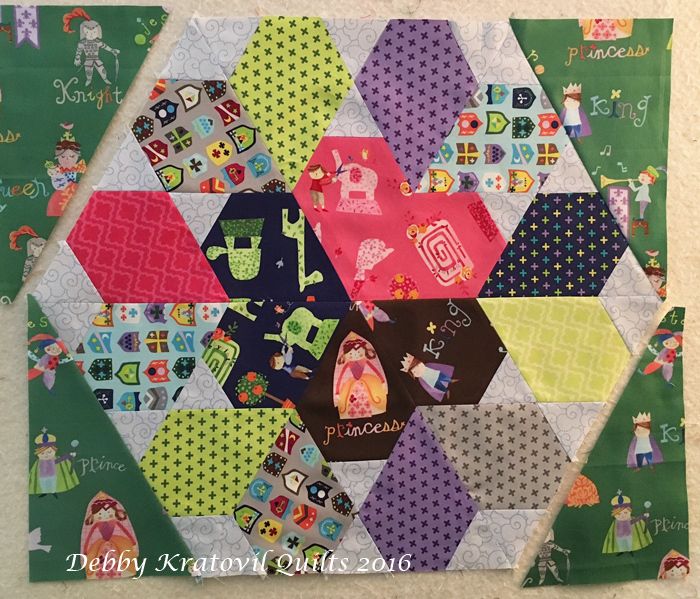 Paired them in groups and generally played for a bit, dreaming up a simple way to showcase the fabrics. 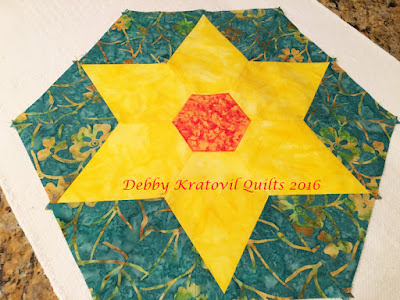 I settled on Snail's Trail Star and made it super sized at 18" square. 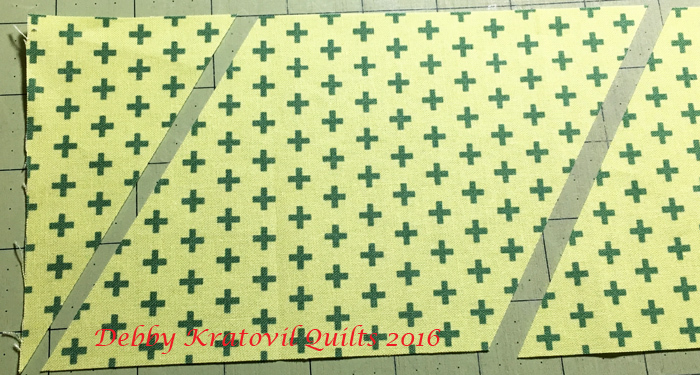 This begins with a 4-Patch of the 5 fabrics I selected (4 main colors and a background fabric). (I share the free pattern at the end of this post, along with clear cutting instructions). Then four of the same fabrics are cut into triangles. These are sewn to the sides as shown. 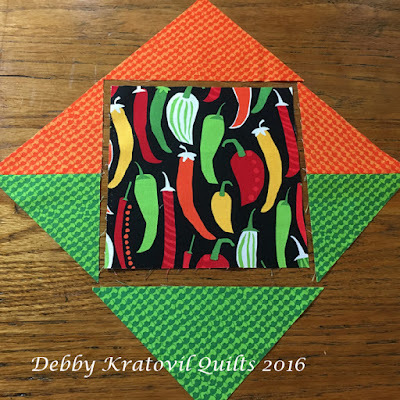 Then larger half-square triangles are stitched with quarter square triangles so that the flow of each color "curves" around. The 3 horizontal rows are ready to be stitched. 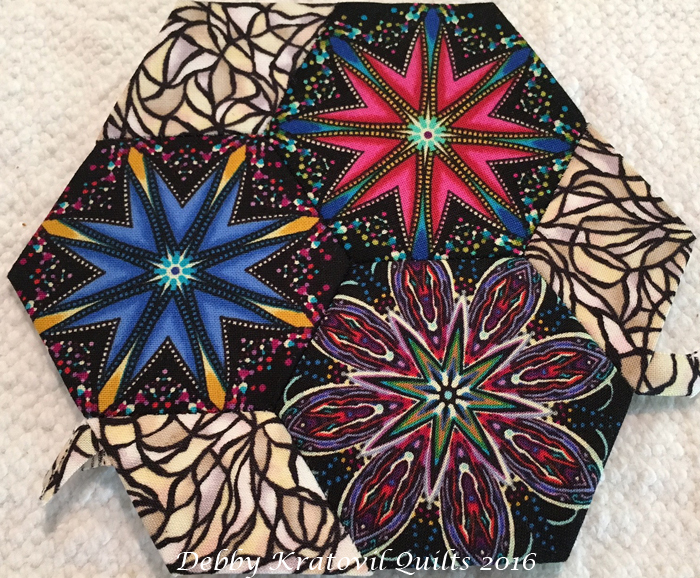 Here is the one page pattern for Snail's Trail Star. And here's a sneak peak of what I'm up to next. I have a kite template (part of the 60 degree angle family) and have been playing with those shapes in the past few weeks. Flora Kite patches. Stay tuned! This Snail's Trail Star is very fat quarter friendly. 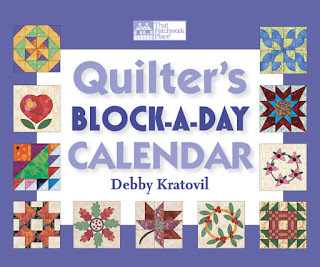 And, with just a few blocks you have a quilt in no time! Thanks for stopping by. 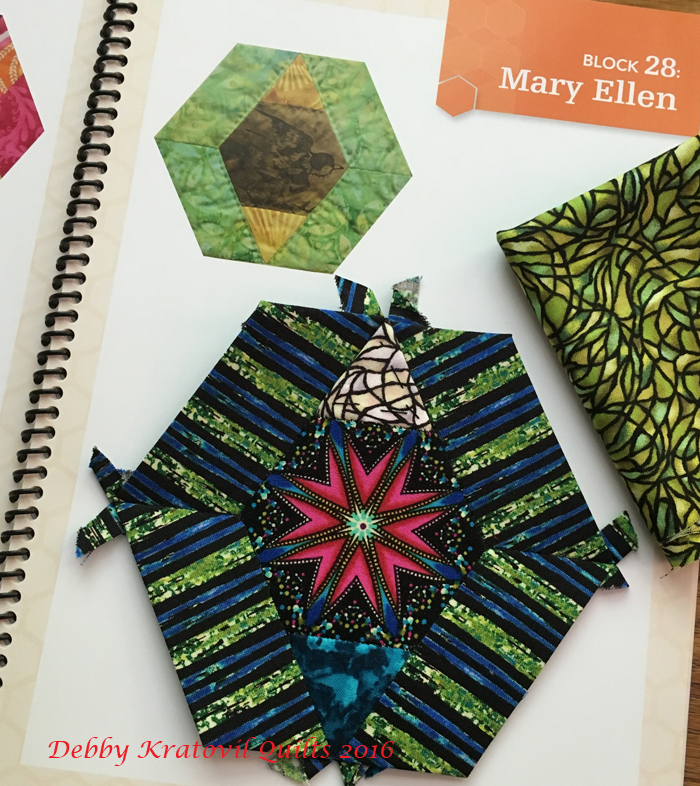 And go take a look at the Flora Collection at the Windham Fabrics site. They are a lovely group of modern fabrics! How can it be May already? We are still having the April showers where I live, but at least they've brought lots of May flowers! Color, color everywhere. The Trillium Wreath block stands alone as the center of this small table topper. 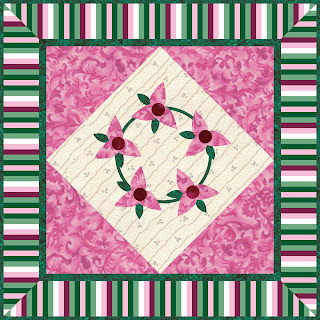 Set on point with pink triangles and then a striped border using all my favorite colors. 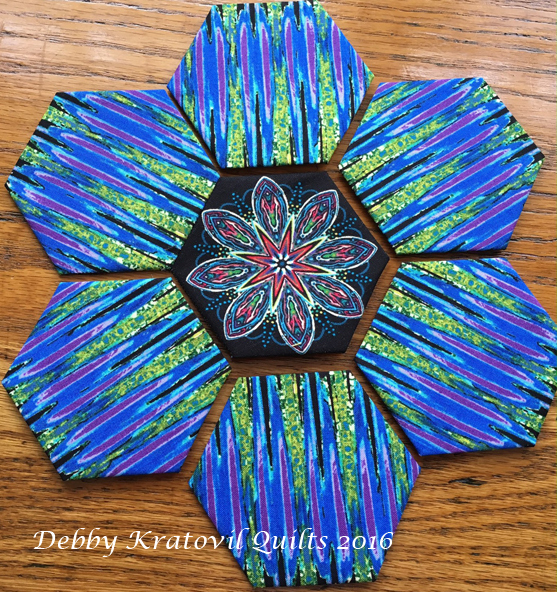 Trillium Wreath: 26" x 26"
And I found the little quilt I made several years ago, folded up in my closet. Poor thing has a fold right down her middle. Will have to let her rest on the bed and relax, huh? 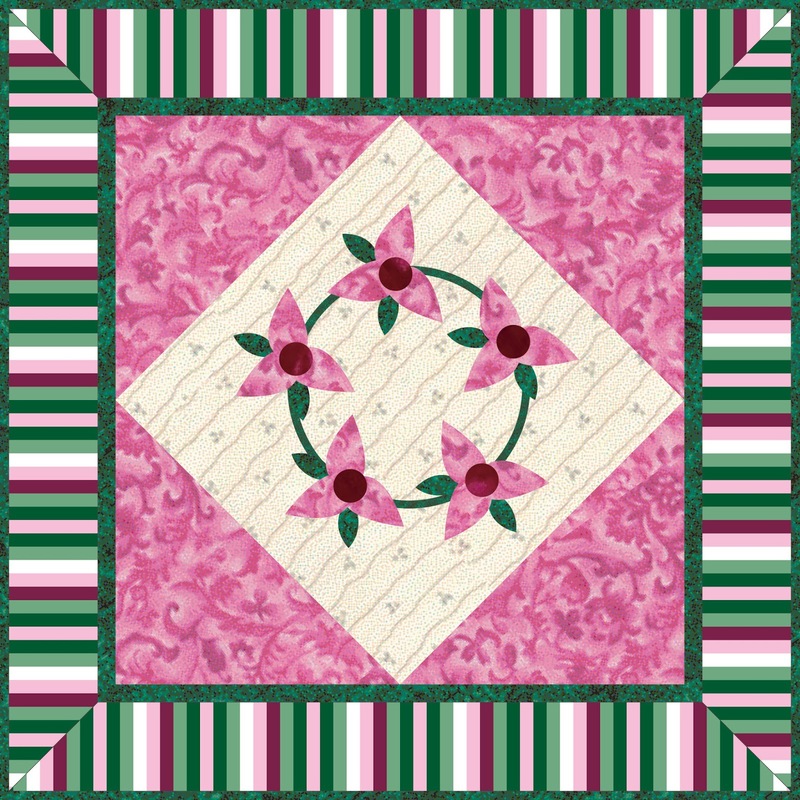 Trillium Wreath Table Topper: 26" x 26"
You do not have to go to Craftsy for this pattern. It will eventually go there, but for now you can download it from the links above. 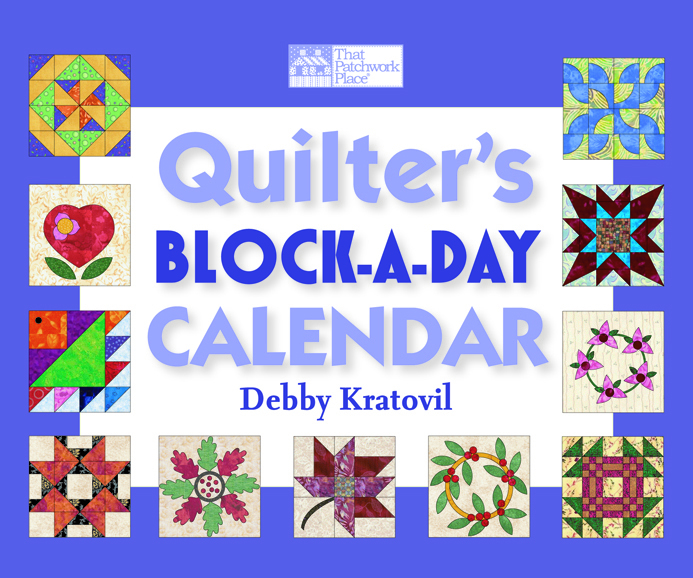 Remember, you need to own a copy of my Quilter's Block a Day Calendar in order to get the pattern for the 12" Trillium Leaf block.